There were three great achievements of Reagan Presidency. The first was that Reagan was responsible for the restoration of America as a proud country, capable of realizing any dream because of the goodness of its people. Secondly, fighting recession with unprecedented tax cuts and the experimental supply side economics. Finally the defeat of Communism. Reagan came into office when the morale of the American people had ebbed and was at its lowest. He came into office after the mess of the Carter administration. Carter had lost control of his government. Feeble attempts at reviving the worst economy after the great depression had not gone well. Carter did not know how to handle the Iran situation. The radicals had the upper hand. The malaise was deepening. Americans were losing confidence in themselves as good-hearted people with noble causes. There was no hope for Americans and they were made to feel that the best was behind them. The rest of the world was going to dominate and the United States can do nothing about it, other than be a helpless bystander. Reagan, the definitive optimist, thought otherwise. He goaded the Americans to use their full potential, saying nothing is impossible as long as one has convictions and believes in them. Once elected, he guided the Americans to believe in themselves that boosted their morale. Americans clung on to this father figure, and miraculously the mood of the country changed. The commiserating public stopped wringing their hands. Reagan had helped them find their backbone. Americans started feeling good and confident about themselves again. Reagan, in his inaugural address, put his stock on the resiliency of the American people. He said that the government was not the solution to the problem but government was the problem. Reagan had complete and unfettered trust in the ability of the American people. He unleashed his conservative ideology ' cut taxes, reduce the size of the government and deregulate industry and businesses ' into effect immediately. He appealed to the best of hope in Americans, and not to the worst of their fears. 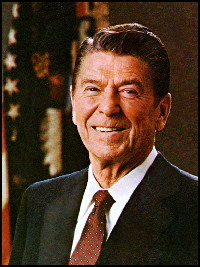 Reagan took bold steps which were controversial during his Presidency. Most of his actions were against conventional wisdom. Though he was not a policy wonk, he had a vision for America and set out to achieve it. He had conviction and a plan. He was able to stick to his principles, prosecute his plan, and overcome all obstacles. His tax initiative was met with stern opposition but Reagan with his charm and trust in the American people, directly appealed to them. The top marginal tax rate was cut drastically from seventy percent to twenty eight percent. The economic boom that ensued went on for well over two decades.